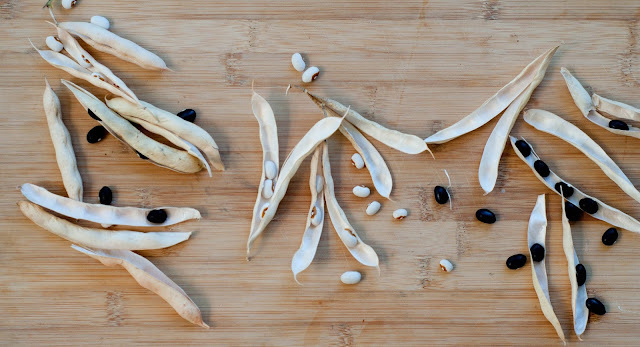 I love to grow "fresh" dry beans because I think they are unique. They are gorgeous and have such rich flavor. I feel however, that "fresh" dry beans leave customers with a lot of questions. How do I prepare these? Do I Soak These Beans? I feel like soaking beans is one of those "cooking things" that we have always done and feel chained to. Now yes, it's true that by soaking the beans will decrease cooking time because they're softened. And yes, it's thought that by soaking you will cut down on the amount of...ummm....tummy troubles beans bestow upon us. However after doing a little research I'm going to say...let it go! Don't soak the beans. However if you're really unwilling to let the soaking thing go, Whole Foods suggests a "Quick Soak": "Put beans into a large pot and cover with 2 to 3 inches of cool, clean water. Bring to a boil then boil briskly for 2 to 3 minutes. Cover and set aside off of the heat for 1 hour; drain well." Start by shelling the beans when you get them home. If you're not going to use in the next few days you can freeze them. For cooking place them in a pot covered by water. Bring to a boil and then simmer until beans are soft. This will take 1 and a half to 2 hours. You may need to add more water to the pot and yes, you'll need to keep an eye on them. Stirring occasionally. Now the world is yours: Bean burgers, burritos, soups, stews, chili, on tacos, on taco salads, cowboy caviar dip and so on and so fourth.